It’s been 16 days since I wrote about my door-project. Lots of things can happen in 16 days, so I thought it was time to give an update again. I’ve had some serious trouble / dobuts about this project since last time. Last week I wasn’t feeling well and all I wanted was to get fast home to my dear read IKEA sofa. And this week I’ve had dasy I’ve been too busy to chase cool doors. “Oh dear, how long am I going to keep up this madness?” The thought has entered my mind. More than once. Some days have been a struggle to get a decent pictures. I’ve shot a few in the morning and that’s not easy since it’s quite dark outside when I go to w0rk. I have been fed up concidered quitting, but I’m still here. Still shooting one door each day. There is something inside me refusing to let go of this project. It’s kinda weird to say it, but there will be something missing in my life if i quit. What am I going to chase if it’s not the doors? It will be weird not to look for doors anymore. And honestly. 124 doors isn’t enough. I need 150 at least. If not 200… I’m gonna do this project and I will pull off that last picture as you squeeze out the last drop of a lemon. I want as many photos as possible. Writing this… I write like I know I’m gonna quit before it’s over the right way (when the 365th shot is taken). And that makes me bah. Because I do not want to drop out! the sun is still shining some days. It’s been minimum with rain and clouds so far this autumn. 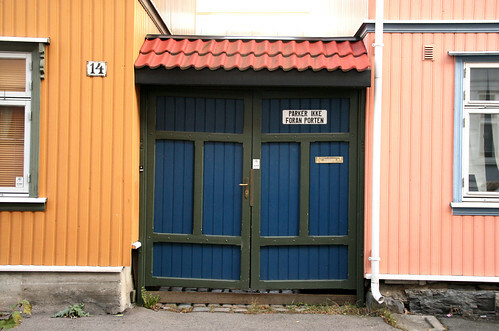 I re-discovered an area (Vålerenga) where there is a good bunch of cool doors to shoot. It only takes me about 15 minutes longer to get home. Chantie said to me here the other day that I got 1/3 done already. That made me happy. Really happy. 124 doors have been shot. 241 left to shoot. Tomorrow is a new day and a new door is waiting for me. Watch out doors! I’m on a mission. You’re about to be shot! Respond to Aim. Focus. Click!